Why should believers in Christ want Jesus to return? New Year's greetings to all of you! 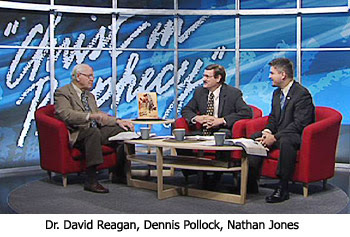 To ring in this new year, Dr. David Reagan, Dennis Pollock of Spirit of Grace Ministries and I discussed on television's Christ in Prophecy six reasons why all who profess to be Christians should earnestly desire that this year would prove to be the year when the Church will be raptured out of this world. Dr. Reagan: The writings of the Early Church Fathers revealed that during the first 300 years of the Church Christians often prayed "Maranatha." That's an Aramaic expression that means, "Oh, Lord come." The enthusiasm for the Lord's soon return, though, seemed to just wane out and die about 400 AD, and for most of Christendom the desire has never been rekindled. Most Christians today seem to be yawning rather than yearning for the Lord's soon return. I believe that the return of Jesus is going to occur in two stages. The first, which could occur any moment, is called the Rapture. It will take place when Jesus appears in the heavens to take his Church — both the living and the dead — out of this world. The second stage will be the Second Coming, when Jesus returns to this earth with His Church to reign for a thousand years. I also believe that most Christians are apathetic about the return of Jesus because they are simply ignorant of what is going to happen when Jesus comes back. I know that from personal experience because that was my case for many years. Think of it this way, how can you get excited about an event that you know nothing about? For example, how can you get all pent up with excitement about a surprise birthday party? You can't; it's a surprise. My personal apathy about the Lord's return rapidly dissipated when I discovered what is going to happen when Jesus returns to this earth. I want to share six reasons why I'm yearning for the Lord's soon return. The first, I want to see Jesus receive what He has been promised, which is honor and glory and power. Dennis Pollock: The last time the world saw Jesus He was on a cross being crucified. Now, I'm not talking about the believers as they saw Him after His resurrection. The last time the world saw Jesus, that is the ungodly, it appeared that He had been totally defeated by His enemies. But, when they see Him again at the glorious Second Coming, He will not be looking beaten or bloody or bruised or anything like that. Jesus will come in glory. There is an expression in the Bible that is used for the Lord's return that is not often used by the Church. I find it interesting that in the Bible sometimes they use certain words that we somehow have never grabbed hold of. One of the words that is used for the Lord's return frequently in Scripture is the word "Revelation," as in the revelation of Jesus Christ. Peter said to put your hope firmly upon the grace that is to be brought to you at the revelation of Jesus Christ. Also, the final book of the Bible is called "The Revelation," but not just a general revelation, it is the Revelation of Jesus Christ. That word means "unveiled, revealed," He will be "no longer hidden." Right now you and I serve a Master whom we have never seen. The world has written books about Jesus. They've painted paintings of what they thought He might look like. But, the truth is we've never seen Him. And yet, on the day when He comes for the Church at the Rapture, we will see Jesus as He truly is. Later at the Second Coming every eye will see Him, and He will be glorified. He will appear in glory. I'm looking forward to that. Nathan Jones: There are just some great verses in the Bible that explain this, such as Psalm 22:27-31, "All the ends of the earth will remember and turn to the Lord." All of it! Picture what the world would be like if that was the situation today. "And all the families of the nations will bow down before Him. Even those who go down to the dust will kneel before Him." The Lord will be revealed to the whole world and all the nations will see Him. That is an exciting and victorious moment which we share in as Christians — coheirs of Christ. Dr. Reagan: The second reason I want to see the Lord return is because Satan is going to receive what he deserves, which of course is total defeat, dishonor, and humiliation. I can hardly wait for Jesus to crush him under His feet! Dennis Pollock: In my boyhood the big thing was cowboy movies and television shows. Cowboy movies were big. Nowadays, it's more super heroes. But, they had one thing in common — both in the cowboy movies and in the super hero movies of today the story usually spends about the first half of the movie showing you how despicable the bad guy is. You get to the point that you hate him. You want to see him get crushed. You want to see him be absolutely destroyed. And then, in the second half, usually the good guy begins to engage him and finally overcomes him. Well, in some ways that's like the history of this planet. We have seen the bad guy. Satan is the most cruel entity that there is in this universe. He delights in misery. He has a good time when children are abused, when women are raped, and when people die prematurely. He loves to see human misery. He is the ultimate bad guy. But, the Bible tells us the good guy is coming. In fact, there is a place already reserved for the bad guy. Jesus said that Hell, also called the Lake of Fire, is a place prepared for the Devil and his angels. It will be at the coming of Christ that Satan will be dispatched and placed in that pit for a thousand years and then ultimately cast into the Lake of Fire. Nathan Jones: Isaiah 14:12-17 is a wonderful verse about the humiliation of Satan. It reads, "Those who see you stare at you.. they ponder your fate. Is this the man who shook the earth and made kingdoms tremble?" Satan is going to be brought so low and we will get to rejoice over him and see that all happen. It'll be exciting! When Jesus returns Satan's end will begin. In the next part of our discussion on six reasons why believers in Christ should be anxious for Jesus' return, we'll continue on to reason three. Praise God!!! We changed the subject! Even so, come Lord Jesus! Those words are hard when your family is not serving the Lord, but I have put my trust in HIM and HE knows best. So EVEN SO, LORD JESUS, COME TO TAKE YOUR BRIDE! Nice to see Dennis Pollock again. I always enjoyed watching him in L&L programs in the past. Praying for peace for your friend with thanksgiving for his survival. Prayers for your cousin that God's hands will guide the surgeons for a succesful op and loving after care. Susie, we've been praying. Any update on your cousin? Hi nathan. Thanks for asking. My cousin (mel) at the moment is in icu recovering from 2 open heart surgeries in the last few days. The reports arent good but im standing in faith that she will make a full recovery. She has 9 children and a few grand babies who need her to stay around. She is a believer..... praise God........ ! I really love her. Its hard to be so far from family but prayer works!